Can you control your home appliances (e.g., a thermostat, security system, or stereo) with your smartphone or tablet? Can your car telephone call for help if you’re in an accident? Does your smartphone automatically give you driving directions from where you are to your next meeting? If so, then you already have a working acquaintance with the Internet of Things. As technologies continue to progress, the Internet of Things will spread to more and more areas of our personal and professional lives. It will open up new opportunities, and it will create some new challenges. Kevin Ashton, a British technology pioneer, first used the term “Internet of Things” in 1999, linking a new idea of Radio-Frequency Identification (RFID) to the internet. CISCO Business Solutions Group claims that the Internet of Things was born around 2008 or 2009 when the number of “things” (e.g., phones, tablets, RFID-tagged products) connected to the internet exceeded the number of people who were connected. By 2010, it was estimated that there were 1.84 billion things per person connected to the internet. CISCO predicts that the number of things for every person on the internet will more than triple by 2020. “Internet of Things” is made up of two terms. Things refers to the devices or objects that are uniquely identifiable and have virtual representations on a network. Internet refers to the interconnectedness of those objects. Related concepts, such as “ubiquitous” and “pervasive” computing describe the environment in which information processing has become so utterly integrated into everyday objects and activities that we are no longer consciously aware of them. “Internet of Things” can imply things-to-people communication, but also things-to-things communication, where things share data among themselves without human involvement. Things talking to other things sounds like science fiction. However the Internet of Things already exists in a variety of domains. 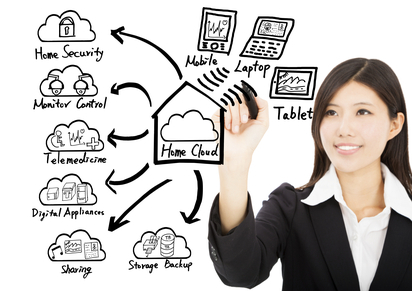 The smart home not only has computers connected to the internet, but also the home’s heating and air conditioning systems, lighting, security cameras and alarms, entertainment devices, and household appliances that all upload data to the network, or are remotely controlled through it. Industrial use of the Internet of Things is growing quickly. Sensors are being widely deployed to control traffic and manage parking, improve waste management, monitor energy consumption, and track products through the supply chain, just to name a few of the industrial applications being developed. Do you watch NCIS Los Angeles? The characters in this primetime TV program use futuristic-looking technology to track down villains by accessing live feeds from street-level cameras and by mining databases full of personal information. The heroes make linkages and find the bad guys in the blink of an eye. It’s a fictional television program, but the technology is not imaginary. The executive producer acknowledges deals with companies such as Lockheed Martin and Microsoft to integrate new and upcoming technologies into the storyline. These technologies may be similar to those already used by the military and other organizations involved in public safety, which use interconnected surveillance devices, remote-controlled equipment, and advanced tracking tools. As mentioned, RFID is a key technology enabling the progress of the Internet of Things. RFID offers a simple, unobtrusive, and cost-effective system of “thing” identification that allows data about those things to be collected and processed. RFID tags require minimal power to function and allow for real-time monitoring. Chances are you can find one attached to, or in the packaging of, a product you have bought. RFID is not the only technology that feeds the Internet of Things. Sensor technologies enhance data collection by detecting changes in the physical status of things. Scanners and readers collect all of the data from things and transmit it via wireless networks. RFID is not the only technology that feeds the Internet of Things. Many household things (e.g., thermostats, appliances) are connected through WiFi networks, and there is an increasing desire for things to be connected outside of a home or office building. Advanced technologies such as 4G LTE wireless will enable a wide variety of machines and sensors to be connected wherever they are. In addition to thermostats sharing data with phones via the internet, humans voluntarily contribute to the data pool when they allow their mobile devices to identify their locations or to post their fitness, health, or activity data to social media and to send data to “the cloud” for storage and retrieval. All this sharing of data leads to Big Data. As of 2012, about 2.5 exabytes of data are created every day—that’s 2.5 billion gigabytes. Data can take the form of messages, social media updates, images, readings from sensors, documents in the cloud, GPS signals from cell phones, and much more. We are producing more data on any given topic than we can possibly manage. The low cost of storage makes retention and destruction schedules a thing of the past. As a result, the sea of Big Data continues to rise at a rapid rate. Are we at risk of drowning in our own data? International Data Corp. (IDC) produced a study in 2014[i] in which they estimate that there were 9.1 billion things installed by the end of 2013, and that number is expected to reach 28.1 billion by 2020. All of those things are producing more and more data, and that is driving increased business interest in the efficiencies, business process implications, and revenue opportunities in the Internet of Things. There is a dark side to all of our devices talking behind our backs. Although the Internet of Things promises to add value to our everyday lives, it also carries potential risks that come from the widespread ability to control, locate, and monitor everyday things. We already suffer the risks of cyber warfare, spam, identity theft, or denial of service attacks, but the Internet of Things has the potential to distribute those risks far more widely and quickly than ever before. Privacy is related to security. There is a power in the Internet of Things that can be used to surreptitiously gather information—to spy—on citizens. However, too much security runs counter to the Internet of Things, which is based on information sharing. Unless your thermostat can openly share information about its status, you can’t remotely adjust it to ensure a cozy home when you arrive. The question remains: how much privacy are we willing to sacrifice to enjoy a fully functioning Internet of Things? And how much security is enough to protect societal interests and our personal privacy? We still need clear answers to these questions and yet we continue, by default, to connect our things to the network to share our personal data. Where the Internet of Things will take us in the future is still largely unknown. We are watching new technologies come online, new players enter the market, and new security and privacy challenges arise. In future posts, ITK Vector Inc. will explore some of these issues, and how they will impact business strategy decisions. In a guest post on Notable.ca, David shares his experiences with electric, plug-in hybrid, and pure hybrid cars. Check it out! LTE Broadcast and the World Cup – the next one? The 2014 FIFA World Cup will be upon us shortly, and it is likely that millions of people around the world will be streaming content on their smartphones and tablet during the course of this event. This will definitely cause network congestion in many locations. LTE Broadcast promises to offer a cost effective solution to this problem! 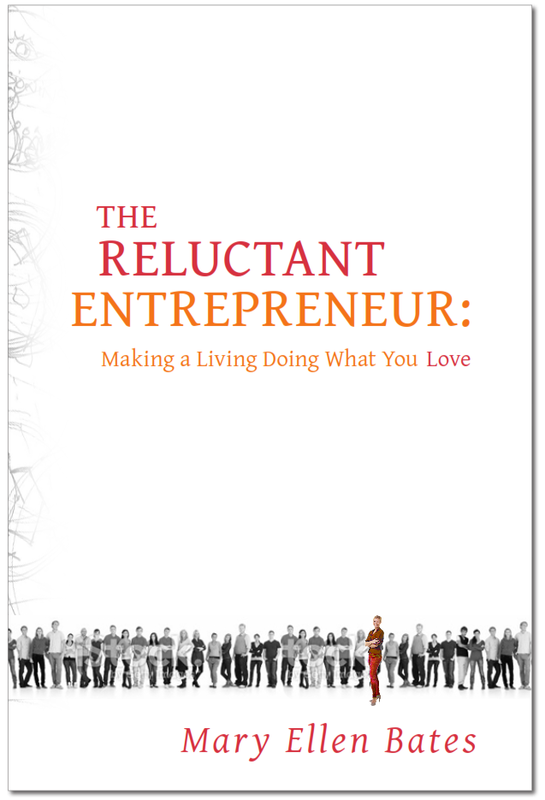 The Reluctant Entrepreneur: Making a Living Doing What You Love is a new book by Mary Ellen Bates. The key message repeated throughout the book is that you can own a successful business doing the work you love. You can attract clients who value your services and who are willing to pay you so that you make a good living and enjoy your life. It is primarily aimed at those people with skills they want to offer to clients in the form of professional services, but it could still be useful to those entrepreneurs who want to launch a business around a product idea that would require outside investors and a product management strategy. You might be a Reluctant Entrepreneur if you have skills of value to others that you love to use. You are willing to move beyond your comfort zone and work for yourself instead of remaining safely (safely?) employed. You want to make a good living, but getting rich is not your top goal. The book includes basic advice on starting a business, such as determining a business structure and money management. Canadians will have to translate some of the US-based advice to make sense in a local context. However, Mary Ellen’s advice on clients is universal. She promises that it is possible to attract clients rather than chase them. First, the Reluctant Entrepreneur must first identify ideal clients in order to find them. The book covers methods of attracting clients as well as their “care and feeding” in some detail. I found Mary Ellen’s thoughts on marketing and branding enlightening. Focused on attracting clients, Mary Ellen shares twenty ideas to kick-start a marketing plan. And she reviews the various tools and how to use them to effectively spread a business message. The Reluctant Entrepreneur wants to own a successful business as part of a successful life, so work-life balance is addressed. It is possible to take a business seriously without letting the business become the sole reason for living. By using time management, contractors, and strategic thinking, it is possible to sustain or even build a satisfying business that leaves room for living. The Reluctant Entrepreneur includes templates, input from a variety of entrepreneurs, lists of tools and questions, and a set of appendices with selected resources. It is an essential book for anyone who dreams of starting their own business, is starting or running a business currently, or wants to shake up an existing business. Mary Ellen shares her decades of experience as a Reluctant Entrepreneur without lecturing. Her voice—that of a helpful professional colleague—makes the book very informative without being dry or tedious to read. Mary Ellen Bates has been running her own business, Bates Information Services, since 1991. Over time, She has evolved her business to meet the changing needs of her clients and has managed to balance a successful business with a happy life. Mary Ellen also wrote Building & Running a Successful Research Business, in which she reveals all the tips, tricks, and techniques for setting up, launching, running, and growing your own information business. The Reluctant Entrepreneur: Making a Living Doing What You Love by Mary Ellen Bates is available for Kindle at Amazon. There is also a companion website with additional information from or about the book.